150 children from Avanti Schools with professional musicians enthral Royal Festival Hall as part of Southbank’s Summer of Love Festival on Sunday 17th July 2016. 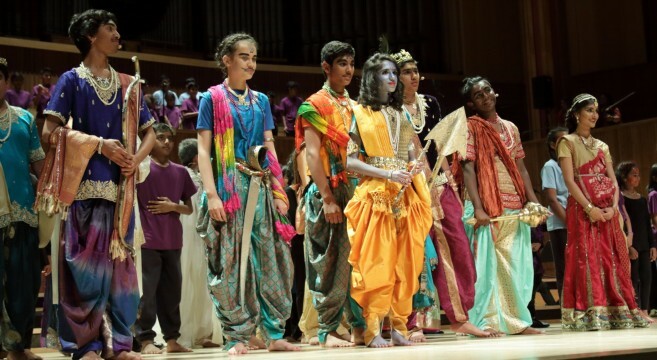 The Royal Festival Hall was home to the magical rendition of the Mahabharata by the talented children of Avanti House Secondary School and Krishna Avanti Primary School in Harrow. The musical, entitled “I’ll Be There”, conveyed the essence of the Mahabharata and the special relationship between Lord Krishna and his friend, cousin and disciple, Arjuna. A melange of Western and Eastern musical traditions, I’ll Be There was an enthralling tribute to the unbreakable bond between spirit soul and the Divine. It’s a great journey of self-discovery in which Arjuna recovers his courage and finds the will to fight for love and service. The awe-inspiring drama was performed by a choir of 150 children and a troupe of actors and dancers, from primary and secondary schools. An eclectic mix of pop, Bollywood, choral and gospel music, dance, mime and words retold the intrigue and treachery that led to the great battle of Kurukshetra. 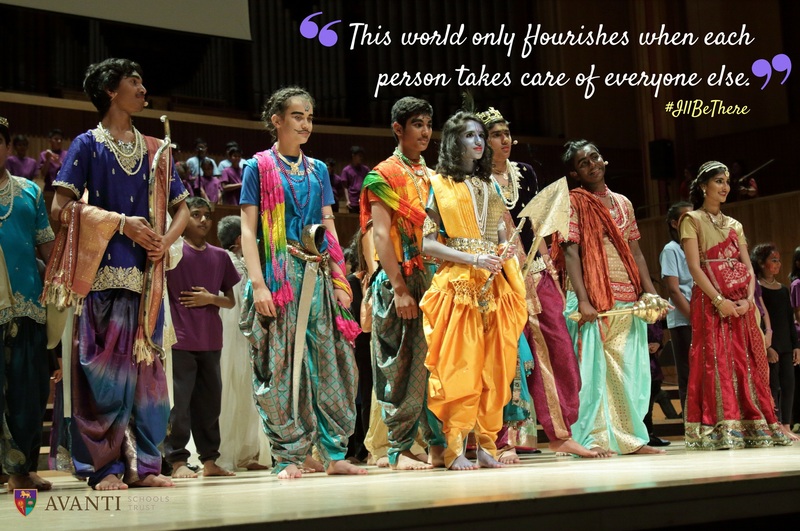 Telling the story of the Mahabharata was apt for the Avanti Schools Trust, which manages a family of four schools currently in Harrow, Redbridge and Leicester, with a fifth school due to open in Croydon in September 2016. The schools are united by the belief that values are essential to a young person’s development – especially the values of empathy, integrity, self-discipline, courage, gratitude, respect and of course, love. The musical was conceptualised, written, produced and directed by Vandana Synghal with support from Bina Antara (Dance), Yvonne Grant (Drama), Paul Nash and Sue McCall (Choir), and the evening was hosted by Usha Sahni OBE, Educational Director of the Avanti Schools Trust. A number of VIPs were in attendance including Mr Anil Agarwal and family, Dame Alison Peacock, Janet Hilary, the Mayor of Harrow, Rekha Shah, Harrow councillors Marilyn Ashton, Navin Shah, Ajay Maru and Christine Robson. Parents, children and members of the public enjoyed an evening of theatre, song and dance, and the actors, singers and dancers all performed outstandingly. Mr Anil Agarwal, Founder and Chairman of Vedanta Resources PLC, made a pledge to fund a state-of-the-art, multi-million pound performing arts facility for Avanti Schools Trust. Mr Agarwal is also the main sponsor of Avanti Schools Trust’s first school on Camrose Avenue. A sponsor a child initiative of £10 per child was set up to invite children from other schools and charities, the cost of which was borne by corporates, families and members of the public. 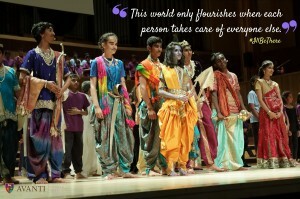 This proved to be very successful, with children from Sai School, Swaminarayan School, Shakha and representatives of the charity Sevacare all in attendance. Avanti’s new secondary school in Stanmore, Harrow sees construction commence later this year. 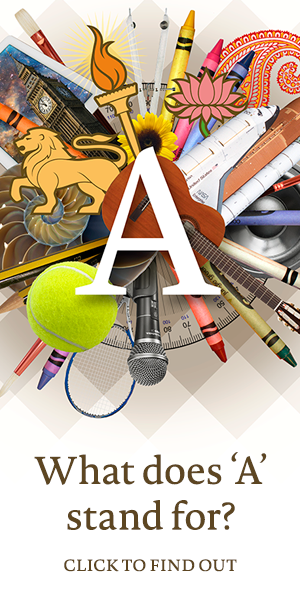 The school will house five football pitches, a cricket pitch, sports hall and theatre, ensuring that whilst educational excellence, character formation and spiritual insight remain at the core of what the schools stands for, an important focus is also made on sports and the performing arts. The Avanti Schools Trust would like to give particular thanks to the title sponsors, Burnt Oak Builders Merchants and Crossville Developments Ltd. and Laxcon Construction. The evening was also supported by Rational FX, Lebara, Amai Vedanta Events, Arvind Jobanputra Insurance Services, Sonas Haute Couture, The Concert Organisation and Nu Sounds Radio. Photography was provided by LDN clicks Photography and all Media & PR managed by Here and Now 365.